Hmmm. I sincerly doubt that. Hey ya'll, I wanted to clear this up a bit for you guys. 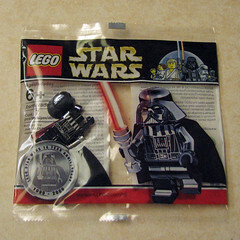 The Chrome black Darth Vader is going to be randomly inserted in 2009 sets in the US just like the chrome gold c-3po was in 2007. this means it won't be in battle packs or retail exclusives (including shop@home, target, wal-mart, etc.). There will be around 10,000 just like last time and it will be a luck of the draw thing, just like last time. the one's in Europe right now are part of a special promotion and I believe it will probably be the only way to get them in Europe. rest of the world is probably out of luck again, just like last time. I'll be on the lookout for one of these sweet puppies next year! Now that's some serious front page worthy news... you continue to rock our socks Steve. Thanks for the scoop. Uh oh. We posted at the same time. The website is going to self-destruct. /dies with anger and annoyance. Steve, I don't suppose you know why these sorts of things are always done in the US and not anywhere else? Ed, it's a pretty well-known fact that LEGO's higher-ups can only survive on a diet of fresh tears of anguish and loathing. Because LEGO is still primarily located in Europe, it's much easier to get a steady supply of fresh tears from Europeans than Americans. Consequently, they release things like this in America to make the people in Europe weep quietly, thus providing the LEGO corporate overlords with much-needed sustenance. what a kick in the balls for the UK & Europe ... again! Steve, will you PLEASE feedback to your management that this kind of thing really is not on. So it's going to be randomly inserted into the TIE sets? Yeah, but not just the Tie sets though. He didn't specify TIEs, which is why i changed the name of the topic to avoid confusion. It sounds like any 2009 SW Lego set, with the exception of battlepacks and exclusives that he mentioned. Does this "US only" really mean "US and Canada only" like it did last time? A figure of 85,000 Worldwide was posted on Rebulscum ... it also refers to 10,000 being in sets in the US, but no news on the what will happen to the rest. Why are Lego doing this? Is it because they get a bigger profit from American sales than European (thus deciding to give yanks more treats as a "thankyou")? Yep, this will be very annoying to everyone in the UK/Europe. I wonder what the reaction is like over at Eurobricks. But they should be thanking us for paying more than America. Wait - did any Canadians find a chrome gold C3PO in sets purchased in Canada? Especially if (like I have heard) the Pirates line has an awful "price to parts" ratio. I would say no, since Canada isn't part of the US and you guys even get different packaging up there on occasion - right? So... official word from a LEGO representative isn't clear enough? I don't think you're going to find much better! 1 lego rep has said 85,000 making reference to the 10,000 for US but no details for the rest of the world, one has said 10,000 for the US only. All I would ask is clear information on this deal for the whole world ... not just the USA. Canadians do not get different packaging from the US. I believe NA distribution is consistent for all countries in NA, ie the boxes should have english, french, and spanish. Once in a while there is a gaf and someone has to slap some new labels on them. I don't know for sure but I thought that Canada was supposed to get the sets with the chrome C3PO's. Correction: that was some random guy on that forum saying LEGO told him that number, so who knows who he talked to (if anyone at all). I'm more inclined to stick to what Steve said, though it would be nice if there were more floating around. That "some random guy" has a proven track record for providing correct information. I know Steve does too, but he is a US rep, not worldwide so perhaps he has only really been told about what's happening in the US and not the Rest of the World. Either way, if there are some in Europe, I'd like to know how to get one. And if there isn't gonna be any for Europe, I'd like to understand why TLC are so bloody short-sighted. I live in Canada and my daughter found one in a 7657 AT-ST set sold at Walmart. Lucky little stinker...but she did agree to sell it to me at the end of the day. It's so hard to not hate you right now Matt, I am so jealous. But oh well, good for you, very nice find indeed. Can I call dibs if you find a second or third?